Back to school, Harry told the school master about his new friend, Krishna. The school master listened to his story but did not believe a word of it. Soon it was the birthday of the school master. Harry became very sad; he had no money to buy him a birthday present. 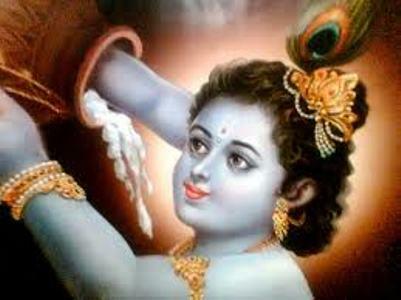 His mother then reminded him of his friend Krishna. Harry did as he was told and Krishna gave him a pot of butter milk. Unfortunately, the school master was not happy with the present. He scorned at it and asked his servant to throw the milk curd away. The servant complied but amazingly, the pot was filled with milk curd again. After several attempts to empty the pot, he ran to the school master to tell him about the incredible happening. ‘What!’ the school master exclaimed ‘it is a magic pot!’ He immediately summoned Harry and asked him about the source of the pot. When Harry replied that his friend Krishna gave it to him, the school master asked him to take him to Krishna immediately. ‘I want to see your friend!’ he exclaimed. ‘My school master wants to see you’ he replied. The school master was bowled over. He returned to the school with his tail between his legs. This entry was posted in Friendship, Mother, Short story, Sri Radhe Krishna and tagged Friendship, Mother, Short Stories, Sri Radhe Krishna by Anita Bacha. Bookmark the permalink.